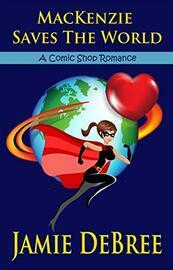 MacKenzie Jones wasn't looking for love, just fulfilling her dream of owning a comic book shop. It seems too good to be true when she meets a candidate for her own personal superhero masquerading as a bookkeeper next door. But he holds a villain's secret that threatens to keep them both from finding their happily ever after. Josh Taylor can't stop thinking about the geeky comic shop girl who's driving his sister crazy with her unconventional marketing ideas. Despite their very different backgrounds, he's more than willing to take a chance on love with MacKenzie. But when his father's business comes between them and a series of accidents nearly ruins both the comic shop and the catering service, it might be more than even true love can overcome.